my living and my dying are for Allah, Lord of the multiverse. what He has provided for them of [sacrificial] animals. Truly your God is one God, so to Him submit. And give good tidings to the humble. Sacrifice of animal for the sake of God and in complete submission and mindfulness is an ancient sacred tradition continued from the dawn of humanity and specially renewed as a memory of Abraham the Messenger of God by the Muslims. Muslims observe Sacrifice, known as Qurbani during Eid ul Adha Festival and as part of Hajj (Pilgrimage) rites by making a sacrifice of an animal and sharing the meat with the less fortunate. Qurban lexically means approaching. It is an act through which one may approach God-consciousness, obedience and reverence. Everything has a reality, haqiqat and the haqiqat of Qurbani is the spirit of sacrifice, is the willingness to give all that there is. And on a very practical level, this Qurbani renews our commitment of sacrificing our wealth because in this urbanized context that is all that we are sacrificing when we are committing to qurbani. Now towards that, if this qurbani can benefit the poor and needy would that not be more fulfilling? For poor people around the world, meat means nutrition, which they cannot get from any other food. It also means celebration but is an expensive treat that many rarely get. Like previous years, Porshee Foundation is willing to sacrifice on behalf of anyone around the world and would like to take the responsibilities to distribute the meat among the poor and needy in a third world country like Bangladesh. As it is permissible to donate all meat, sharing your Sacrifice with the poor means living the spirit of selfless generosity fully. All praise be to Allah for giving us the capacity and inspiration to arrange sacrifice of Qurbani on behalf of anyone who willing to authorize us to perform it on-behalf. We distribute all the meat to the poor and needy. This year, 2013, the Eid ul Adha is probably going to be on 16th, 17th and 18th, depending on the moon sighting. 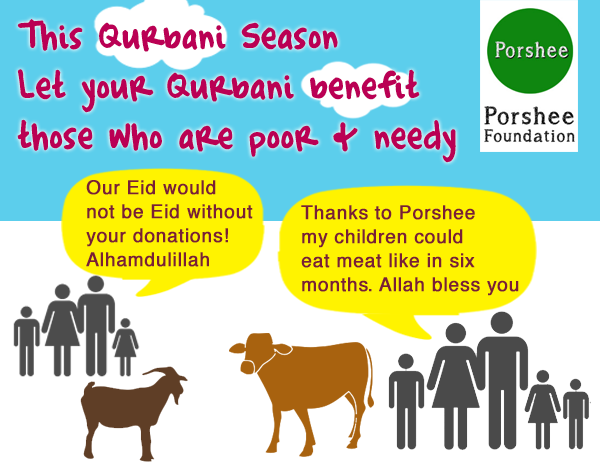 We, from Porshee Foundation, will arrange the Qurbani in Bangladesh and distribute everything to the poor and needy. Once you make intention and authorize us to perform the Qurbani on your behalf, depending on your budget, we will purchase either goat or cow, the two kind of animals mostly available here. For a goat that provide meat of 8kg to 12kg, it costs about $80 to $100 USD. This includes the cost of logistics, fee for the person who will sacrifice and skin etc. For a medium sized cow that provide meat around 20kg or more, it costs about $200 USD to $300 USD. A higher price will buy a bigger cow, which means more meat to be distributed to more families. Feel free to donate any amount you're comfortable with and let me know Full name (along with father/husband name) on behalf of whose Qurbani will be offered. Also let us know the contact email to intimate the beneficiary about his/her Qurbani. Kindly spread this and partake in countless blessings and spiritual merits by spreading to those who might be looking for offering Sacrifice but may not be aware and whereabouts. indeed that person shall be satisfied. * What does qurban (sacrificing an animal) mean? Why do Muslims sacrifice animals? What are the wisdoms behind it?